The Zebra has analyzed the funniest, quirkiest, and most annoying types of rideshare drivers and broken down easy tips on how to handle them. Uber topped the second place AirBnB by over $30 billion last year in valuation, making it the most valuable tech startup. Young professionals and business travelers are increasingly using rideshare apps to get around. They’re foregoing car payments, rental cars, and taxi services for rideshare services’ ease of use and relatively cheap costs. Unless you’ve been living under a rock, you’ve probably used a rideshare service before. So you may know, for all its benefits, using a rideshare service can be a bit of a guessing game. You have to ride in a complete stranger’s car and being forced to make conversation — or worse, forced to sit in silence — for the duration of the ride. Sometimes you get lucky and the person is a great conversationalist, has snacks and lets you pick the music. But more often than not, rideshare drivers make things awkward one way or another. 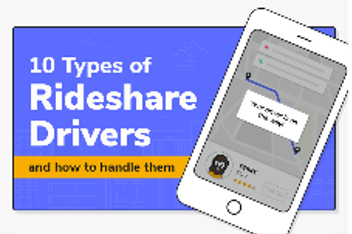 So, check out this infographic below to see how to deal with the most common types of rideshare drivers. My personal favorites are Family Man Frank and Oversharer Olivia.